New Delhi:(Page3 News Network)-The Union Ministry of Water resources today organised a function to mark birth anniversary of late Mrs Indira Gandhi, the 1st woman Prime Minister of India “ the National Integration as celebrate “Water Conservation Day". It was intended to create awareness regarding concern about depleting water resources & its vision for the water underlining the Ministry’s commitment to be an active contributor to the sustainability of this very important natural resource. 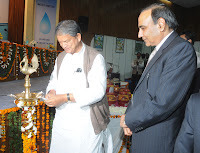 Shri Harish Rawat, Union Minister of Water Resources presided over the function and Shri Rajendra Singh, the Raman Magasaysay Winner 2001 and President of ‘Tarun Bharat Sangh’ , was the guest speaker. Speaking on the occasion Shri Harish Rawat emphasized on the importance of water conservation as the need of the hour in view of the limited resources and growing demand for domestic, industrial and agricultural uses. He said we have to make concerted efforts to save water for our future generations. He also cautioned on the instances of water pollution emerging out as a potential health menace. Shri Rawat also advocated for the cleaning of rivers and said that adequate attention has been given to this issue in the National River policy. Shri Rajendra Singh, the noted water conservation activist highlighted the importance of water and shared his experiences. Shri Dhruv Vijai Singh, Secretary (Water Resources) addressed the gathering and emphasized that the event was organized to create awareness on concerns and vision for the water in view of the depleting water resources. He briefed about the various steps taken by MoWR like Artificial Recharge, Rain Water Harvesting and Mass Awareness Programme for augmenting water resources. The Vote of Thanks was proposed by Shri N.S. Samant, Joint Secretary, Ministry of Water Resources. The Inaugural function was followed by technical presentations on Water Conservation by Central Water Commission, Central Ground Water Board and Delhi Jal Board. A programme on water conservation was organised by FORCE, an NGO active in the field of water conservation wherein the student/children group associated with the NGO presented a street play on water conservation “Dharti ka Neerharan” by children which was followed by views of various RWA’s on water conservation. A small exhibition was also arranged of the theme at the venue.